Skeem Saam is a South African television drama series-turned-soap opera created by Winnie Serite and produced by PEU Communication Solutions in association with the Gauteng Film Commission and SABC Education, about three teenage boys who grapple with tough conflicts as they navigate their journey to manhood in a Limpopo township. A hit and run accident throws 16-year-old Tbose Maputla and his friend Kwaito Seakamela into incredibly challenging situations, testing their friendship to the limit. Skeem Saam is a blend of stories about the journey to manhood. It examines the plight of today's male children and the tough challenges they face transitioning into manhood. The underlying premise for the local drama series is that real men are made, not born. Teenage boys naturally challenge themselves. They wish to find out what their limits are. Lizo will explore his journey in a safe way but Kwaito and Tbose will take life-threatening risks. Who will survive to see his 21st birthday? Who will grow into a healthy, responsible man? What are the responsibilities to fathers, uncles, teachers and neighbours towards shaping the next generation of men? Skeem Saam challenges old notions of masculinity by promoting the new positive young versions of masculinity that are emerging in our modern society. The aim is to offer young people the opportunity to become themselves and not just their gender. Through the series they will learn that they shouldn't be limited by stereotyped gender roles and rules and that all human beings are the same and are deserving of the equal treatment. 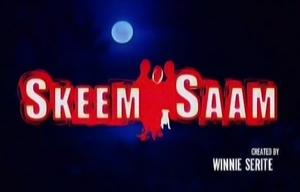 Skeem Saam was created by Winnie Serite and produced by PEU Communication Solutions in association with the Gauteng Film Commission and SABC Education. Serite is the executive producer. The theme song is by Tuks. Masilo Magoro replaced Mpho Molepo in the role of Charles Kunutu from Season 2. Lydia Mokgokoloshi (Koko Mantsha) and Mogau Paulina Motlhatswi (Mapitsi) were starring cast in the first three seasons, but were reduced to recurring in Season 4. In Season 4, Amanda Du-Pont (Lelo), Shoki Sebotsane (Ma Kunutu) and Bongani Masondo (Mangaliso), all previously recurring, were promoted to starring. The series premiered on SABC1 on Thursday 13 October 2011, at 20h30. The first two seasons of the show played out as a weekly drama, but the show was extended into a daily drama from Season 3.